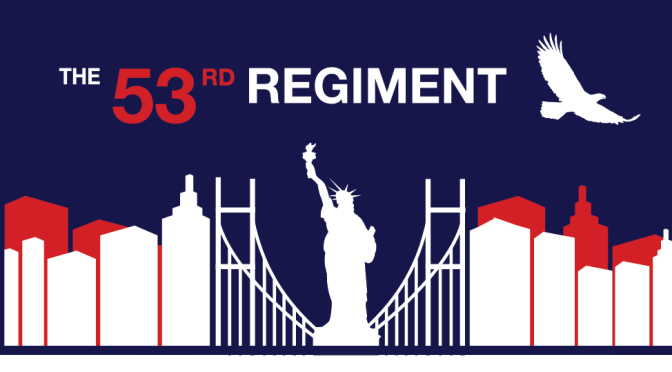 The 53rd Regiment is a community of interest established to give voice to God loving Americans, Patriots and Veterans to share their love of country, experiences, stories, knowledge and their opinions informed through life experiences and serving the United States of America. The 53rd Regiment is your forum to push back against those who fail to recognize this nation’s unique founding and the sacrifice of previous generations of Americans to preserve her. To recognize all the blessings bestowed on the America through the Lord, our Framers brilliance in forming this union, and to give voice to upholding our American way of life and traditions. The 53rd Regiment stands unwavering for traditional values, federalism, and the qualities that are unique to the American culture and character that make us exceptional. We are a beacon of truth, justice and liberty in challenging times where political correctness has run amuck. The magnetic force that is American exceptionalism is that clarion call that offers this world our best chance at life, liberty and the pursuit of happiness. America’s best days are ahead of us. The 53rd Regiment Banner: The American Eagle flies above the statue of liberty & American landscape soaring high to protect, preserve and guard against those who wish us harm. The 53rd Regiment Motto: Be Heard! The Editorial Board of this site consist of a few Vets that are part of the 22 million military veterans blessed to serve this country. We believe in a positive spirit and continuing to serve through this platform. After combined military service of 40 years, we began this site as our next mission, to “fight” for what we believe in and offer a platform for others. The Purpose of The 53rd Regiment is to give voice to the average American citizen and the forgotten men and women of this great land, and to provide a forum where they can take their message to the American people directly and “Be Heard!” There are no credentialed media here. This is a platform for We The People. An invitation. We invite our readers to participate in the 53rd Regiment and “Be Heard!” Have you ever wanted to write an article or an Op-Ed? Here is your chance. Use our Contact Us page to send an article or to tell us what we’re doing right or what we can get better at. Please comment after reading an article and give us your opinion. If you would like to be a guest author, please contact us. This is your forum. Be Heard!